These works are part of an ongoing series of drawing based on photo booth images of people. These people happen to be my mum and my dad, but the fact they are of my mum and dad is only really of interest to me. 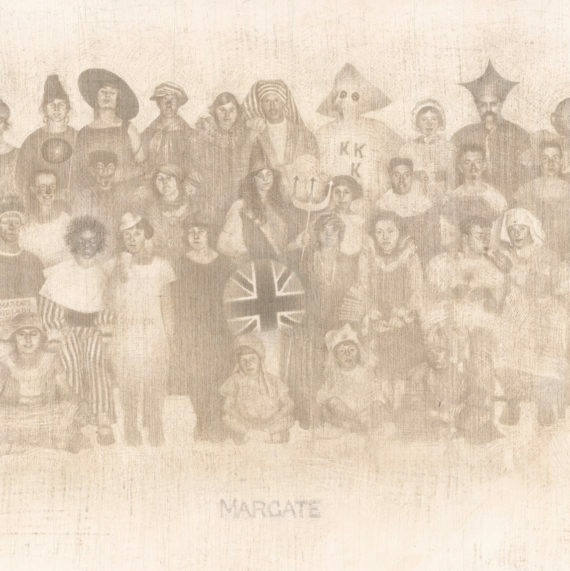 They are drawings of people whose image was captured in automatic photo booth pictures (the old kind, from the 1970s and 1980s, when there would be a sequence of four images and the least bad of them was used for the bus pass or whatever). They record little self-conscious moments which no one else saw at the time. 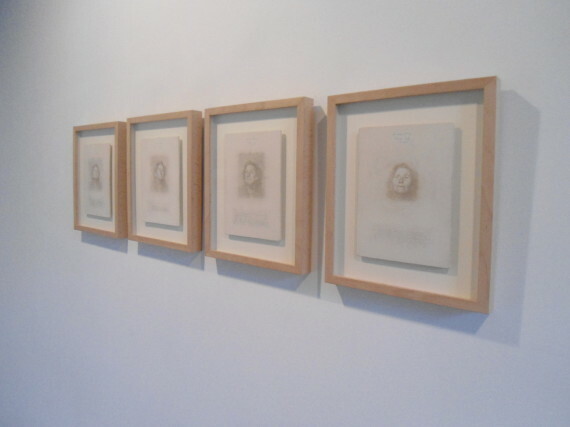 These drawings of these tiny images are about 7cm x 9cm in size and they are drawn on gesso-covered boards of roughly A5 dimensions. 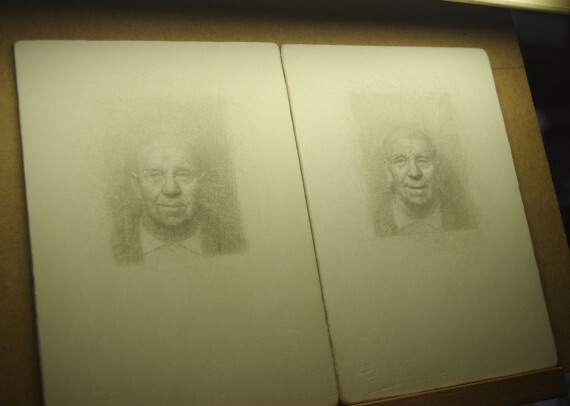 The medium is metalpoint (specifically silverpoint). 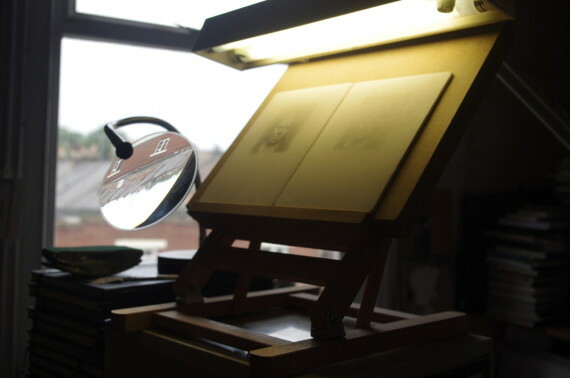 This is literally drawing with a point of metal on a prepared surface. It’s a medium which is most commonly associated with Early Renaissance artists of Florence and Umbria but I use the medium in different way to that of The Old Masters. I spend a long time preparing the boards with umpteen layers of gesso so that I’m able to repeatedly rework the drawings with sandpaper, etching needles and scalpel blades as well as with the points of silver wire. It’s a very subtle medium in that it has a limited tonal range: the line won’t be made anymore emphatic for being being pressed harder. It’s an unprectable medium: the traces tarnish with time to a warm. 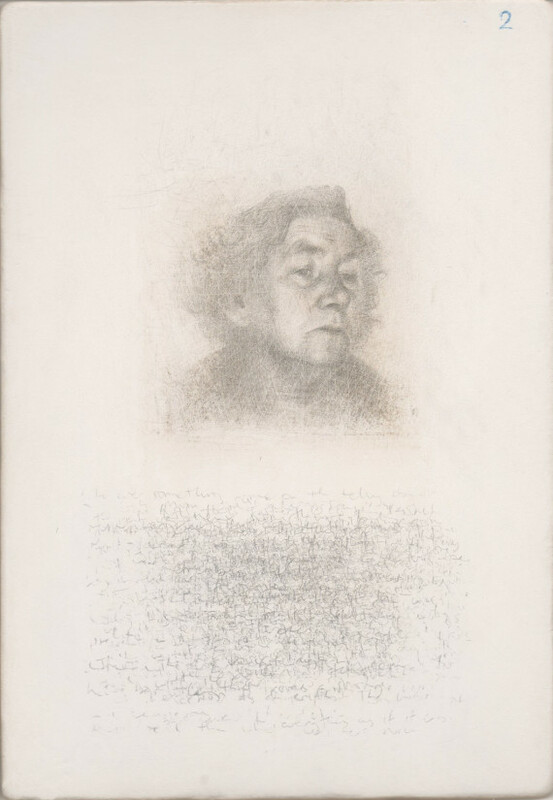 It’s tricky to rub out silverpoint lines (think of a coin scratched across an emulsion-painted wall) and so the mark is a definite, but delicate, trace of the presence of movement (of a moment of life?). 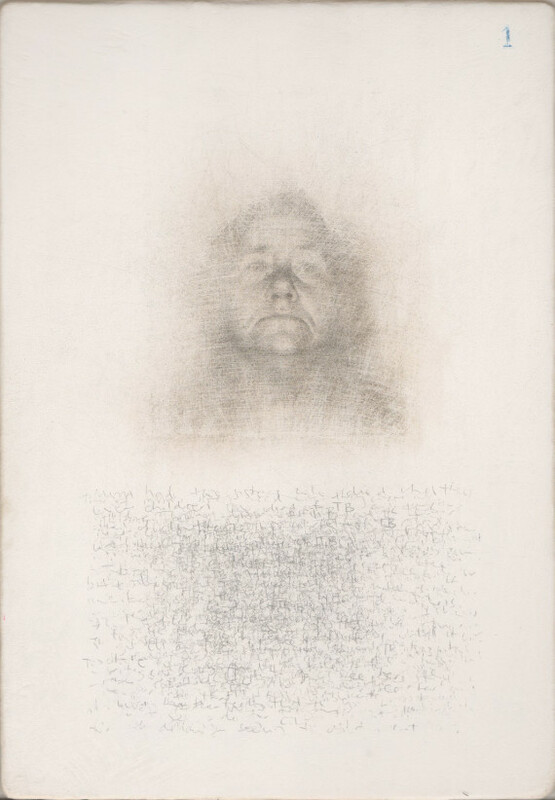 Each of these images includes a block of hand-written text made up of transcriptions of remembered speech. Hand-writing is also a kind of drawing. The repeated layers of handwriting create a sense of spatial depth and distances (and perhaps distances of time) but they are also fragments of sentences which recall remembered speech and stories. 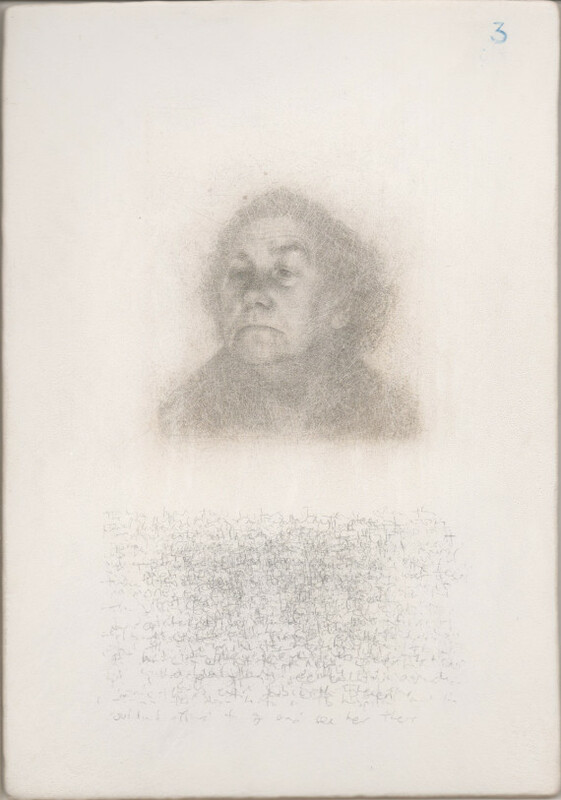 The viewer might alternate the gaze between the drawn lines making up the image of the face and the drawn lines of words. I could say a lot more but I’d rather the viewers make up their own minds as they spend time with them and simply looking at them. The work is gradually ongoing.